1. ADD A LUGGAGE TAG – show off your personality and ensure all your personal information is easily displayed. 2. PERSONALIZE WITH STICKERS – Like an oversized passport, decorate your luggage with stickers from all the places you visit. 3. 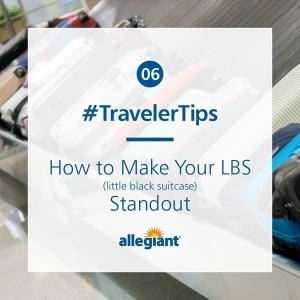 USE A COLORFUL LUGGAGE BELT – A pop of color on your bag will ensure your suitcase is easy to spot and keep your bag from bursting at the seams.